The first sight was the Olympic stadium. 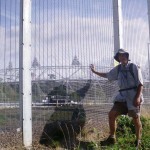 The area around it is still being re-developed, so we could only look through the fence. A bit further on we came to the start of the greenway that was blocked off when I tried to ride my bike here a few weeks ago. We went up far enough to see that it is now open, and stopped to harvest some wild apples before returning to the river. 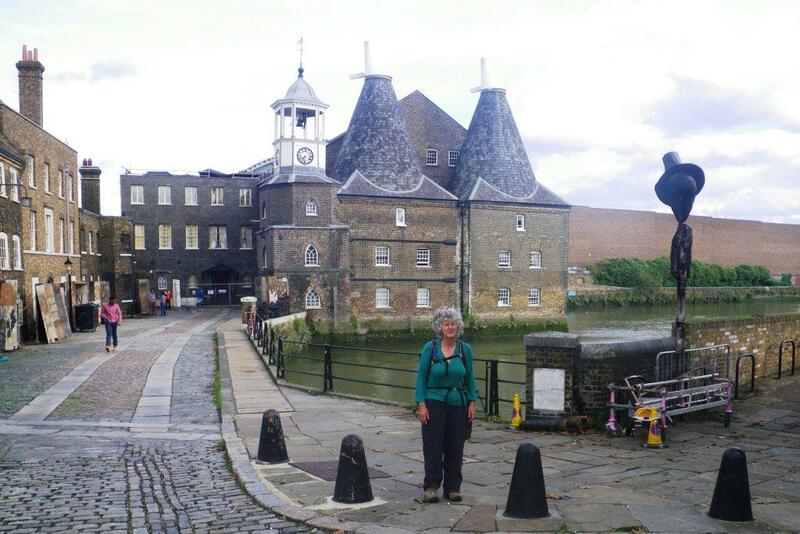 The next place of note was Three Mills, which was one of the earliest industrial centres of London because of its tidal powered mills. They were grinding flour for bread here over a thousand years ago, and by the 17th century were also grinding grain for alcohol. 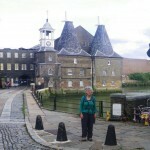 The alcohol trade existed here until the end of the 20th century, but now it is best known as the Three Mills Studios, which produces TV shows and movies. While we were checking it out a man told us that they are currently filming the movie “London Fields”, which will be released next year. As we were crossing a bridge above the Bow locks, we stopped to watch some fishermen with huge fibreglass rods over 8 metres long. One of them pulled in a good sized fish, and he he told us was a common carp, but which isn’t actually common in this location. 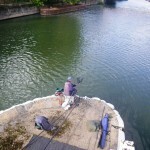 I knew carp were introduced into Britain by the Romans for food, so I wondered why the fisherman threw it back instead of keeping it for dinner, but a little further on a notice informed us that the East London rivers are the most polluted in the country. The Limehouse Cut was opened in 1770 to shorten the distance from the river Lee to London. At one point a modern highway has removed access to the old towpath, so now there is a floating pontoon which carries the path for several hundred metres. 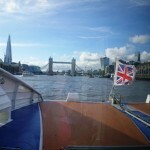 At the Olympic opening ceremony, David Beckham travelled up the Limehouse Cut on a speedboat carrying the Olympic torch. We have already explored the Limehouse basin where this canal ends, so we turned off at Ropemakers Field, which is now an attractive park. In times gone by this area was an important part of the docklands industrial area. 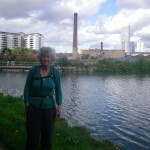 This brought us to the Thames Path, alongside flash modern apartment blocks. We had intended to catch the Docklands Light Railway back to the city, but it was such a nice sunny afternoon that we decided to travel by ferry instead. 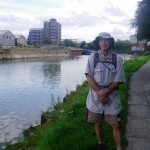 It was most enjoyable seeing all the various places we have walked to strung out along the river in a proper sequence. Although it isn’t the cheapest way to travel, it is certainly more scenic than the train. After disembarking at the Embankment Pier, we walked through Charing Cross and up to Oxford St, were we bought a few clothes for a certain 2-year-old who will be visiting us at Xmas. We stopped on the way to buy an expensive and insipid coffee from a French restaurant, which made me wish we had downloaded the app which tells you where all the Kiwi baristas work. On the way back we poked our noses into a huge four-storied building that sells nothing but M&Ms (and related merchandise). Getting people to pay you so that they can advertise your products seems like the ultimate marketing success story to me. 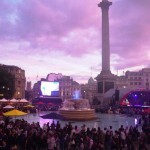 It was evening by this time, so we headed back to Trafalgar Square where there was a Malaysia Festival happening. 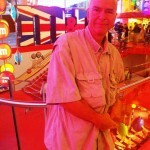 There were lots of food stalls run by the city’s Malaysian restaurants, so we were expecting a good dinner. Unfortunately a couple of hundred thousand Londoners had the same idea, so we spent quite a lot of time in queues. After about 20 minutes in our second queue we got near enough to the front to find that the pancakes they were selling had traditional Malaysian fillings like Nutella and frozen yoghurt, so we decided to bail out and start again. Fortunately there was entertainment laid on that we could watch on big screens so it was quite pleasant. Although a little bit of lion dancing goes a long way. The fountain in the centre of the square had dozens of floating lotuses, each with a tiny LED light, so it was rather magical. We both enjoyed being out and about in the evening with such large good-natured crowds. And it was nice that when we’d had enough, we just had to walk down a few steps to the tube and be whisked home in a few minutes, well before the drunks turned up on the streets. same countryside – and great to see it is so unspoiled. Keep them going please. This isn’t a subject I have any expertise on, sorry. The water quality isn’t great to be sure, but flushing the pollutants further downstream might not be the best solution. I suspect that in the long term it would be better to try and minimise the contaminants that go in. Here in NZ there are some rivers and lakes which have voluntary community groups acting as guardians, organising working bees to remove rubbish, etc. Perhaps your club could organise something similar? If you got some official recognition of this role from the local authority I imagine it would give you a stronger position to advocate for changes to river management.